Anne Hathaway’s pregnancy style is totally steal-worthy! As if we didn’t love Anne already, her baby bump fashion is so chic and fearless it makes me want to rock out those leather pants, too! The Oscar winner is in her third trimester, but that isn’t deterring the 33-year-old first time mom from looking super-trendy. While grabbing some tea with a friend in Beverly Hills, Anne wore an ankle-length cardigan with a diamond pattern, leather pants, and comfortable and understated top. For a pop of color, Hathaway proudly wore red lipstick and cat-eye sunglasses. Actress, fashion-guru, and mom-to-be! You can totally copy the look with several options. Ankle-length cardigans can be found at several retailers, but Lord and Taylor has a lightweight rayon/spandex blend version that is machine washable – moms know how important that is! It also has pockets and is currently under $50. 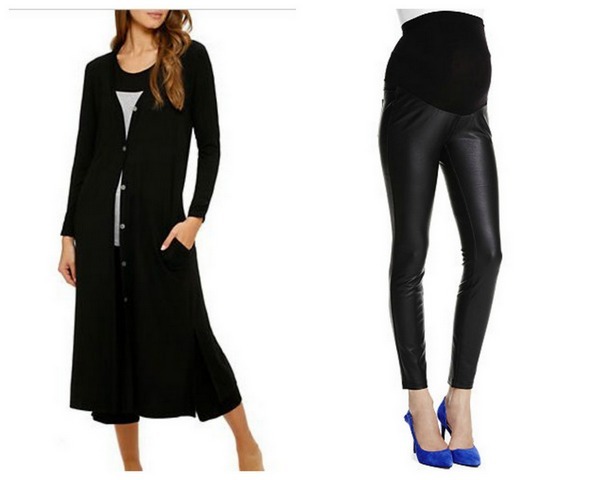 Thanks to Jessica Simpson’s line, you can also get maternity faux-leather leggings at Macy’s for $35 that you can also toss in the washing machine. Speaking of ‘The Princess Diaries,’ director Garry Marshall let slip that another Princess Diaries could be on the way, too! “I was with Anne Hathaway a couple weeks ago, it looks like we want to do Princess Diaries 3 in Manhattan,’ Marshall explained told the People. “Anne is very pregnant, so we have to wait until she has the baby and then I think we’re going to do it,” Garry stated. What do you think of Anne Hathway’s pregnancy style? Even more exciting, what do you think of the possibilty of another Princess Diaries movie? Let us know your thoughts in the comment section below!